The Colonial surveyor, W H Angove, made the first reference to the ‘Goode Beach’ frontage as Frenchman Bay in 1887. His plan of this area, part of the Plantagenet Land District, was designated Plantagenet Location 2471. It showed the wreck of the Runnymede and an unnamed lake (more recently named ‘Lake Vancouver’ on the second subdivision application plan. William McBride, who had been serving on an American sealer that visited King George Sound, decided in 1869 to settle in Albany. In 1888 he acquired Location 2471; it contained much of what is now the settlement of Goode Beach. There he built a cottage on stone foundations -known then as “The Bark Hut “on his newly acquired estate near the intersection of the junction of present day Austin Road and McBride Road. At this time Frenchman Bay was remote and difficult to access. At the turn of the 20th Century, picnickers would pay a small fee to be ferried to Whalers Beach. There were even moonlight cruises to the beach. When the Norwegian whaling station was built in 1912 supplies also had to be ferried. The first rough road to Whalers Beach was not completed until 1934. The road opened up the Torndirrup Peninsula (much of which had been proclaimed a national park in 1918) and Whalers Beach to tourists. In 1936 a hostel was constructed above Whalers Beach where two decades earlier the quarters of the Norwegian whalers had stood. The hostel was a popular destination for holidaymakers who travelled from Perth. In 1959 the site was converted into the Frenchman Bay Caravan Park to cater for the growing tourism industry. Meanwhile William McBride’s estate passed through several hands, and was eventually acquired by Eric Goode in 1956. Goode managed a small farm and remnants of the wire boundary fencing on his property can be observed by hikers today. In 1952 a new whaling venture was started in Frenchman Bay following the construction of the Cheyne Beach Whaling Station, situated on the bay to the east of Whalers Beach. In addition to the modern facilities, houses were constructed for employees. The operation brought unpleasant odours from the rendering of carcasses, depending on weather conditions, to the Frenchman Bay subdivision, until the whaling station was closed in 1978. Eric Goode’s farm consisted of four Plantagenet Locations 365, 374, 2104 and 2471. 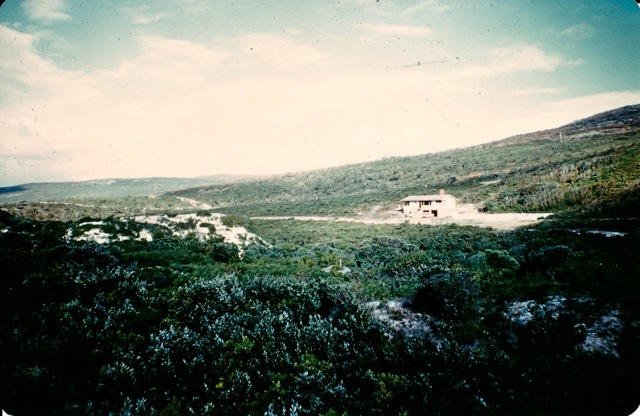 Eric Harley and partners acquired part of Location 2471 in 1960, the section that included the beachfront to the present Goode Beach. A power line to the Whaling station was in existence by 1961 and reached the site of the Harley residence in Frenchman Bay Estate in 1962. Eric and Win Harley and their young family became the first permanent residents of the new settlement in 1963. Their house is shown in the 1963 photograph below. The area being developed was known as the Frenchman Bay Estate; it was progressively extended and subdivided by Eric Harley and his associates through to 1986. Development of the area known as Discovery Woods was carried out by Eric Harley under the name of Vancouver Holdings Pty Ltd from 2004 to 2017. The Albany Road Board initially opposed the first application for development. Further discussions ensued and the opportunity was there to apply for subdvision approval for lots fronting Klem Road (named after the whaling vessel Klem, Runnymede Street (named after the wreck on Goode Beach), La Perouse Road (named after the ill-fated French explorer Jean-Francois La Perouse who sailed past the entrance to King George Sound before meeting his death in the Pacific), and St Georges Crescent. In 1980, the abandoned Cheynes Beach Whaling Station was acquired by the Jaycees Community Foundation Inc. with the support of the Federal and State governments for conversion into a whaling museum. Early on, the development hit a hurdle when it was learned that the Shire of Albany regulations prohibited it from approving the development of a shop within a mile radius of the caravan park site. To solve this problem, the Shire altered the ownership of the site from Leasehold to Freehold in 1986 and the ownership of the caravan park passed into private hands. Over the next few years, the property changed hands several times while continuing to function as a caravan park. In 2005, the owners of the site approached the City of Albany for approval to develop a large tourist resort above Whalers beach on the former caravan park site. In 2006 the owners abruptly demolished all buildings without reference to their heritage value. The site remains undeveloped. ‘Long Beach’ had been named ‘Goode Beach’ in honour of Eric Goode in the 1960s. The settlement of Goode Beach, originally part of the Frenchman Bay Estate, was so named in 2000 by the City of Albany at the suggestion of the Frenchman Bay Association. The decision was taken to divide Frenchman Bay into three separate localities: Frenchman Bay to include the whaling museum and Whalers Beach; Goode Beach to include the settlement fronting Goode Beach; and the Vancouver Peninsula to include the area from the settlement to Point Possession. Once adopted by government authorities, the proposal could not be undone even though it was widely felt by residents that the name of Frenchman Bay should have been retained for the settlement of Goode Beach. We thank Eric Harley for access to his historical records.